Cherokee offers bulk bags for a variety of industries and purposes. Though, beyond selling bags to our customers, we also like to provide resources for using our products. Here we will look at several ways you can fill bulk bags quickly and efficiently. Our goal in providing this information is for our customers to be able to use our products safely and effectively. When filling bulk bags with materials like sand, stone, top soil, and other minerals you can save a large amount of time using a filler bucket attachment. These filling buckets attach to loaders, telehandlers, track machines, and more. Filler buckets easily scoop up, transport, and fill bulks bags. These can be operated by one person, which makes them ideal for farmers, grain merchants, and quarry workers. It has a ram operated opening and hooks that hold the bag in pace while filling. Filler buckets also come as an attachment for forklifts, which provide a very stable ride for filled bulk bags. A forklift’s smooth handling helps reduce spillage during the transport of goods. 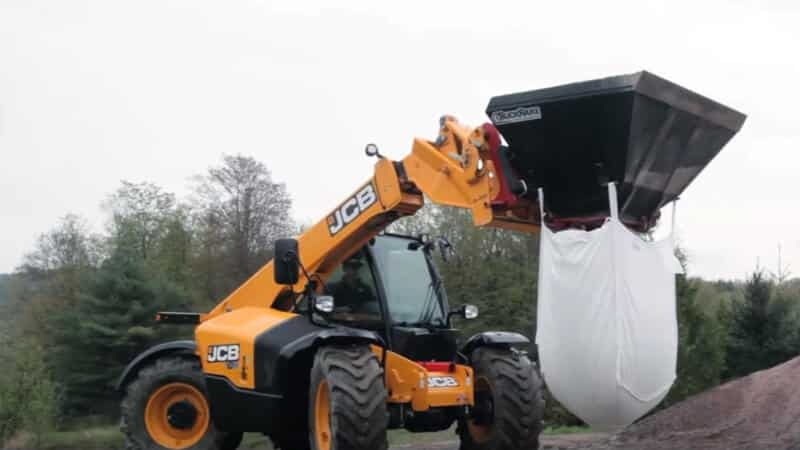 Bulk bag materials can also be weighed via load cells that can be fitted to the bucket. These come in a variety of sizes for different bulk bag capacities. Another option to fill bulk bags is to use a stationary filling frame. These filling frames or stationary filling stations provide a stable and safe solution for loading material in the bag. This helps reduce labor injuries, requires no power, and allows you to utilize existing loading equipment you have on your heavy machinery. Filling frames are a cost-effective solution, and they greatly reduce spillage during the filling process. Our final option for filling bulk bags is the most expensive, but is capable of filling the greatest amount of product in the least amount of time. Automated filling systems are often custom manufactured, but there are pre-built systems available to fill large amounts of bulk bags in a process. These save time by removing many of the manual steps required to fill bulk bags. They also offer additional options to reduce the dust mess that can be associated with the dumping of some goods. These are a great option for larger operations that fill a large amount of bulk bags on a consistent basis.